What's the tastiest use for leftover bacon fat? While The Takeout is collectively an advocate for preparing bacon in the oven—hell, just make it candied bacon while you’re at it—we recognize that some people prefer the standard stovetop method. No problem there: As long as you’re cooking bacon, you’re golden in our eyes. The skillet method results in a jar of bacon fat, which you should never, by any means, discard. It’s culinary gold, you see, usable in so many delicious applications that you’ll want to fry bacon just to render some of that sweet, sweet fat. Because we can never have too many bacon tips, we asked some experts what they do with this nectar of the gods. Bacon fat flour tortillas take breakfast tacos to new heights; heights that can only be taken by bald eagles. What’s more American and awesome than bacon fat and bald eagles? Just replace lard in your tortilla recipe with bacon fat, and there you go. Combine the bacon fat with kosher or sea salt and use it on popcorn, or make a peanut butter and bacon fat sandwich (I’m not kidding). You can also use the fat to confit chicken wings. Make a warm bacon vinaigrette with sherry vinegar, and the oil subbed out for bacon fat. We’re currently using this on an asparagus salad. Bacon fat can be used for everything! I keep a jar in my refrigerator and scoop out a bit each time I’m making fried rice or sauteing vegetables. When I build up enough of it, I use it to fry chicken. There’s nothing better. The way I use leftover bacon grease isn’t for consumption—it’s to season my cast iron skillet. After cooking my bacon, I’ll leave the leftover fats in the skillet to cool overnight. The next day, I’ll heat up the skillet, pour out the oil, rinse, and wipe clean. My cast irons have been rust-free and non-stick ever since. 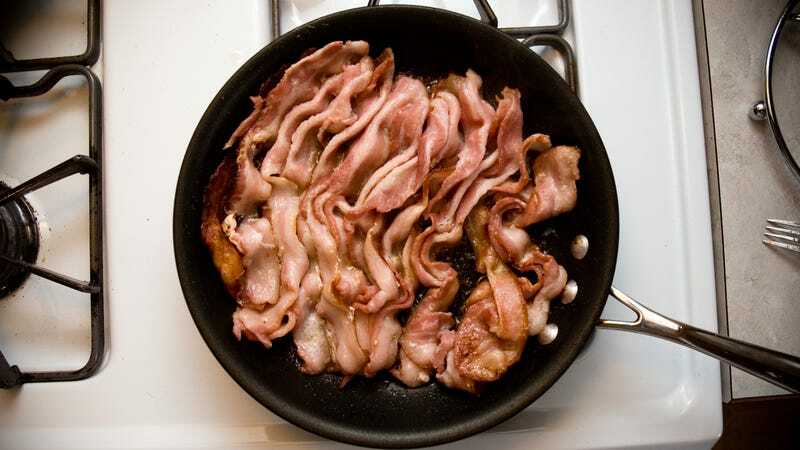 There are so many reasons to save bacon fat, especially if you do a lot of cooking! In the morning, I will cook my eggs or hash browns in it; this just adds another layer of flavor. You could also use it to roast your brick chicken, replacing the oil with bacon fat. If you wanted to make bacon fat butter, when the bacon is liquid form and in the cooling stage, you can infuse it with herbs or salt and pepper. Then as it’s still cooling, pour it into a stand mixer and keep whipping it into a lardo-type texture. You could spread that right onto bread, or make a 50/50 ratio of whipped butter to whipped lardo. You can also make bacon-fat candles, using regular candle-making directions but substituting bacon fat for the soy or coconut oil. Just make sure to strain the liquid fat first. I use bacon fat for apple streusel topping: Swap in bacon fat for half of the butter, and cut them both with brown and white sugars, flour, and sometimes oats. Bacon fat brings out a salty unctuousness to cut through the sweetness of the sugars, and butter brings the milk fats to the party to give you a toasty nuttiness. Point/Counterpoint: Is cottage cheese gross?